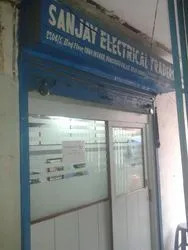 Incepted in the year 2005, Sanjay Electrical Traders is a reputed name in the wholesale trading and distributing business, dealing in a diverse gamut of electrical goods like Energy Panel Meter, Rotary Switch, Power Contactor, Power Wire And Cable, Electric Protection Relay, MCB And MCCB, Testing Instrument and more that are sourced from renowned names such as AE, Cadel(Eltrac), Conzerv, L&T, Siemens and BCH. In addition, we also manufacture a range of panel meters that are of premium quality. We have a team of experienced procurers, marketing executives and quality inspectors whose every endeavor are directed towards attainment of complete client satisfaction. Our rich vendor base has enabled us to meet the precise client requirements with utmost efficiency. Under the able guidance of our mentor, Mr. Ganpat Singh and Mr. Manish, we have been able to carve a niche for ourselves in the industry in a short span of only three years. His constant motivation and an optimistic attitude have inspired us to put in our best efforts. We are authorized distributor of C & S.
It is owing to the unswerving commitment of our team that we have been able to serve our clients with premium quality products and garner appreciation from them. To ensure the smooth functioning of our various business activities, we have divided our team into different teams of personnel holding specialization in their respective fields. Our team comprises procurement agents, electrical engineers, technicians, skilled labor, quality controllers, sales and marketing professionals, and administrative staff. The effective negotiation skills of our procurement agents help us in bringing down the overall cost of the consignment. The engineers and technicians supervise the production process and ensure that our range of panel meters is manufactured as per the correct technical specifications. Our capability to efficiently meet the needs of our clients is solely dependant upon our vendors and thus, we have ensured that we maintain cordial relations with them. Our vendors are like our partners who assist us in creating a distinctive identify in the sphere of electrical goods. To ensure that our customers receive their desired products within the committed time-frame, we work in cohesion with our vendors as one team. This establishes the fact that deciding a vendor is a crucial factor that plays a pivotal role in the relations shared between us and our clients. Moreover, we ensure that all our dealings with our vendors are fair and transparent.